Johnny Bench baseball cards are some of the most sought after from the late 60’s through the early 80’s. The beloved former Cincinnati Reds catcher played for 17 years and won two World Series championships, 10 Golden Gloves and 2 MVPs during that time. ESPN named him the best catcher of all-time. 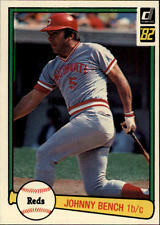 He was the leader of the “Great Eight”that made up the Big Red Machine teams of the 70s. Some argue that the 1976 Reds were the greatest team ever to play the game. In 2011, the Reds Hall of Fame erected a large, bronze statue of Bench in honor of his legacy. An easier way to honor his legacy for the average fan is to collect his baseball cards. And with this list we’ve rounded up the top 24 Johnny Bench baseball cards that any serious collector should own. Enjoy! 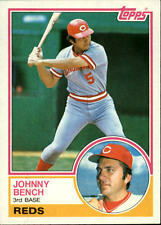 Johnny's first appearance on a Topps card had him sharing the space with the Reds’ Ron Tompkins. Bench won a Golden Glove his first year in the league, proving he wasn't your average rookie. He was known as a threat both on offense and defense. The photo of Bench on the card has him fresh-faced and cap backwards boasting those famous Reds pinstripes of the day. This card is the only officially recognized Johnny Bench rookie card out there, and mint specimens can go for over $2500! Don't worry though, it's still possible to score a card in decent condition for under $100 to add to your collection. Johnny finished the 1968 season with stats so high that he bagged the National League's Rookie of the Year Award. He kept the fire going in 1969 by setting the highest caught stealing percentage in a single season with 57%. Johnny's All-Star Rookie card features him knelt down, mitt open posing for the camera. The 1969 Topps set is infamous for its poor centering, print defects and tendency to chip. This makes finding a decent copy fairly difficult and a mint condition card can easily go for over $1250. In 1970, the Big Red Machine showed they would be a force to be reckoned with by making the first of four World Series appearances. Bench had the season of a lifetime in 1970. He would win #3 of his 10 consecutive Golden Glove Awards while also winning the National League MVP by hitting 45 home runs, 148 RBI and batting .293. The 1970s Topps set is either loved or hated with its dull grey borders. Don't let that stop you from grabbing a card from one of the most important seasons in Johnny's career, though. While mints run around $600, there are many fair quality cards available for reasonable prices. A former Army man, Bench joined Bob Hope's United Service Organizations Tour of Vietnam in the winter of 70-71 to help raise the morale of troops overseas. While 1971 is often viewed as a down year for Bench because it was sandwiched between two huge MVP years, no collection is complete without his 1971 Topps card. Known for its infamous black borders, it is often terribly unforgiving and the cards show any wear and tear that they have gone through. The photo on the card shows Bench with a bat in his hand and a smile on his face. His autograph trails across the full color shot. Because good quality cards in this set are so hard to come by, a mint #250 can go for over $3800! In 1972, Bench would once again reign as the National League's Most Valuable Player with an impressive 40 home runs on the offensive side, and a 56% caught stealing percentage which was the second highest of all time. The Reds managed to power through to the World Series once again, although they still came up short in the end. The 1972 Topps baseball card set is easily their funkiest ever made--a sign of the times. The bold colors and wild font have become many a collector's favorite. The set popularity paired with the incredible season that Johnny had makes this card as valuable as $4700 if you can get your hands on one in perfect condition. Affordable alternatives can be found so you can still have your own copy of one of the best Johnny Bench baseball cards of all time without parting from too much cash. While 1973 was not quite as big a year for Johnny as the one previous, he still managed to make the All-Star team, one of his 14 appearances during his career. This card features an action shot of Bench making a catch mid-game in foul territory dangerously close to the visitors dugout. This particular Topps set was prone to bad centering, making good quality cards harder to find. For the first time since the 60s, the information on the back of the card was displayed vertically. High quality Johnny Bench #380s can go for over $2200. Before the Reds would come back to make world history, they had one more season out of the limelight. Johnny had an excellent personal season, with nearly 200 hits and a league-leading 129 RBI. This card shows Bench taking off after a hit with a bright red banner above and below the photo highlighting the team's name. A small cartoon on the back of the card humorously points out that Johnny is a singer of country music. He would later go on to appear in multiple TV shows and even a stage performance in Cincinnati. It was the year that The Big Red Machine would finally win the world series. The Cincinnati Reds would defeat The Red Sox 4-3 to win the championship. Johnny hit 28 home runs and 110 RBIs throughout the winning season. The card commemorating this fantastic season shows Johnny crouched down, hand in the hinged mitt that he made so popular. He started using the mitt after a thumb injury damaged his catching hand. While 1976 was an excellent year once again for the Reds, Johnny was suffering with chronic injuries which hurt his overall performance. He still managed to lead the Reds right back to the World Series, this time up against the Yankees. Bench out-hit the Yankees’ catcher, Thurman Munson, and the Reds went on to win for their second year in a row. Johnny was awarded the World Series Most Valuable Player for his role in leading the team to victory. Johnny did much better throughout the ‘77 season, although The Reds would not return to the World Series that year. This card features a close-up shot of Bench with his helmet on, ready in his batting stance at the plate. The bottom of the card boasts his All-Star status with orange stars on a blue background. It's hard to come across a decent specimen from 1977. Topps used an especially terrible paper stock that year, which has not let the cards age well. The edges commonly chip and there are plenty of printing errors. 1978 would be the first year that Johnny Bench would not receive a Golden Glove Award. The Big Red Machine was winding down, as was Bench. The photo of Johnny on the #700 card reflects the tone of the year. That being said, the card itself has a punchy and colorful design with interesting fonts and a great yellow border. Johnny still holds his All-Star badge, which can be seen in the top right corner. The Reds clawed their way back into the postseason, but didn't make it past the Pirates, who eliminated them in just three games. It was not a record-breaking season for Johnny, although he once again made the All-Star team. The card shows an action shot of Johnny making a run for it after a hit. This set marked the first appearance of the Topps’ logo on the front of the card. Unfortunately, this set is also notorious for poor centering and flimsy cardstock. Once again using action shots, the Topps 1980 set featured colorful banners on the top left and bottom right corners showcasing the player’s position and team. Johnny's autograph is scrolled across the photo in black. The back of this card had a small cartoon boasting about Bench’s MVP titles. At this point Johnny had caught 100 games over 12 seasons. It was a year of firsts. Donruss came on the scene with their first set, giving Topps some much needed competition. Johnny had a less pleasant first, as 1981 was the first season that he did not make the All-Star team. It was clear that he had peaked, although he was still considered a highly valuable team player. The card shows Johnny up to bat and ready to hit. A bright green line borders the photo. The Donruss logo and the year of the set can be seen in the top left corner of the card. The first Johnny Bench card from Fleer features a posed photo and a clean layout. The use of the baseball to house the team name was a great design choice by the company. Cards in this set are fairly easy to get your hands on. You can even grab a mint condition #196 for around $45! While not his most famous season, no Bench collection is complete without this card. While Topps finally did have some competition, none of the other sets have held their value quite like Topps. This Johnny Bench baseball card has a close up shot of Johnny smiling, wearing a red cap which matches the the cartoon hat on the card design used to showcase his position and team. Even though his ‘81 season did not land him a spot on the All-Star team, this card was printed after the ‘80 season and commemorates one of his last year's with the title. In 1982 Johnny continued his foray into television by hosting a show called, “The Baseball Bunch.” Bench and some other winding down greats would teach a group of kids all about playing the game. This Donruss card features an action shot photo of Johnny surrounded by a green border. They took cues from the other card companies by incorporating fun cartoon features into their design. Even though this card is from a lower part in Johnny's career, and from a set that's easily attainable, this card is worth having for its visual value alone. The design of the card is so coordinated with the photo of Bench that it looks almost like a professional mat job. The photo also captures something special in Johnny's face, as though he's looking off into his future. This Johnny Bench baseball card from the aptly coined “hockey stick set” from Topps is a nice addition to any Bench collection. The card has a close up portrait of Johnny smiling with a clear blue sky behind him. His autograph graces the photo in black. There are many great condition copies of this card still around, so for very little cash you can snag this little sliver of history for yourself. This Fleer Johnny Bench baseball Card has him mid-throw, with the ball still in his hand. The team's logo is displayed in the bottom left corner. Johnny's name and position are in the other corner under the photo. It's easy to find these cards for sale all over the internet to help you collect the final pieces of the Johnny Bench puzzle. Bench was no longer The Reds’ catcher, having been moved to the third base position. The last of the Topps cards we're looking at today comes from a set where Topps switched things up by putting two photos on the front of the card. One of these photos is a full size action shot of Johnny hitting the ball, while the other is a posed headshot of the baseball great. A red and orange border highlights the two photo spread. A fitting end to the collection of a legend, the final Fleer Johnny Bench card has a close up shot of Johnny sporting a genuine smile while talking to a reporter. In his 17 seasons, he had played his best and he could retire with the satisfaction that brings. His entire baseball career can be found on the back of this card, making it a very interesting piece of memorabilia. After going through this list of Johnny Bench baseball cards, it's easy to see why he is so highly revered in the world of baseball. After his retirement at the age of 35, the Cincinnati Reds decided to set retire his #5 so that the memory of Johnny's career would stay alive for years to come. He ended his legacy with 2,048 hits, 1,376 RBI, a .267 overall batting average and a .991 fielding percentage. Johnny won 10 Golden Glove awards for being the best at his position in the league. Catching 118 shutouts during his career, Bench is rated 12th of all time for major league catchers. He was known for his massive hands, which definitely helped make him the renowned catcher he came to be. Bench was inducted into the National Baseball Hall of Fame in his first eligible year in 1989. With numerous awards and honors to his name, it's easy to see why so many call Bench the greatest catcher of all time. In his later years, Johnny took up professional golf and has even co-written a few books. An award in his honor is presented to the top collegiate baseball catcher each year. Collecting this catcher's cards gives you a chance to hold some amazing baseball history in your hands, and as he is still alive today, you might just be lucky enough to snag an autograph.